In essence, a woman stunned by the violent murder of her husband tries to make sense of it, and of her new role as a widow, in the hours immediately following his death. But, as everyone knows, Jacqueline Kennedy, the focus of Pablo Larraín’s quicksilver drama Jackie, was a living legend in her time. In common with her husband, President John F. Kennedy, she was more of a national symbol than a living, breathing human being. Her case is unique, and so is the film. The combination of Natalie Portman’s acting, Larraín’s directorial touches, and Mica Levi’s original score is able to take a subject we think we know well, from “history,” and turn it into a numbed-out psychodrama enacted by larger-than-life characters, a story of duty performed amid chaos. 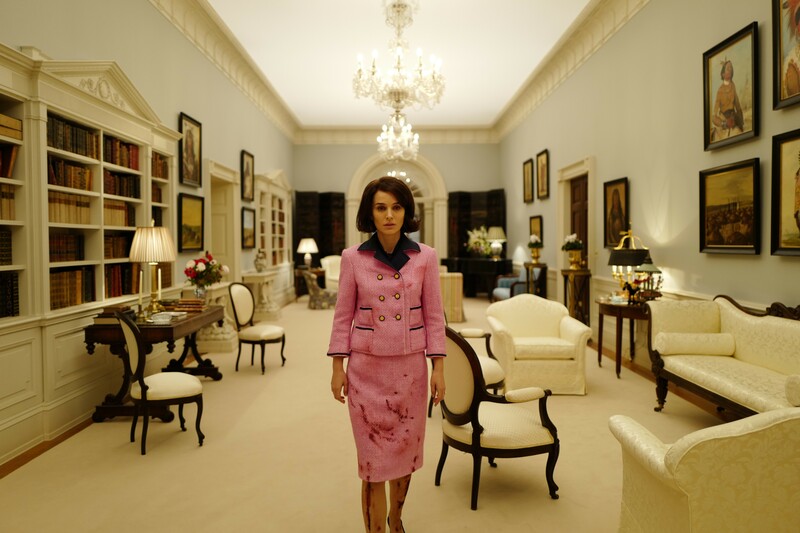 As Jackie (Portman) bumps her way distractedly through rooms and corridors in Dallas, Texas and the White House in November 1963, composer Levi’s swooning orchestral strings spread a blanket of queasy disorientation over the events. The solitary First Lady is still wearing the pink suit she wore for the fatal limousine ride, now soaked with her husband’s blood. She takes the time to carefully blot the stains off her face. Figures appear in front of her: Her brother-in-law, Attorney General Robert F. Kennedy (Peter Sarsgaard); her assistant, Nancy Tuckerman (Greta Gerwig); the children, Caroline and John Jr.; and a consoling priest (John Hurt). In the background, newly sworn-in President Lyndon B. Johnson (John Carroll Lynch) and his aide, Jack Valenti (Max Casella), are impatient to take the reins. But Jackie, in shock but nevertheless in charge, refuses to fade away quietly. Her imperative patrician manner asserts itself even though she appears incapable of walking into a room unassisted. All this is rendered in the form of a sort of waking nightmare, a tour of psycho-political touchstones stopping off in the Oval Office, Arlington National Cemetery, the children’s sterile playroom, a hearse hurtling through Dallas, and the grassy knoll. There’s a sense of artificiality, of carefully preserved facsimile, to even the most mundane of the settings. We’re observing Jackie’s ordeal through a thoroughly doctored lens. Chilean director Larraín — whose second release of the year, Neruda, opens here in January — is well attuned to the ironies of his subject’s life and times. It’s clear that the blueblood Mme. Bouvier Kennedy Onassis considered herself Queen of the United States. She came from different stock than the roistering Kennedys with their bootlegging, mistresses, and family feuds. When she asserts that, “There is a great divide between what people believe and what I know to be true,” the proposition is laid before us in stark, back-of-the-ambulance terms. Jackie makes these points while guiding us through some of the most anxious hours in U.S. history, without sacrificing whatever remains of the romantic notions of the Kennedy era — the only miscue is the corny ending. The film is not a document, nor a myth, nor a political indictment, but a completely subjective, artfully wrought fragment of the American mystique.